On average, 22 times a day, 1 time every 65 minutes someone hears that voice telling them that killing themselves is the only way out. The purpose of our event is to bring awareness to all of the Veterans that are struggling to get up every morning and face another day. We want to bring awareness to the soldiers that think there is no hope, no reason to leave the house, and no reason to make friends. We need them to understand that there are people that want to help, there are people that will talk to them, there is someone else out there that is going through, or has gone through what they are feeling. 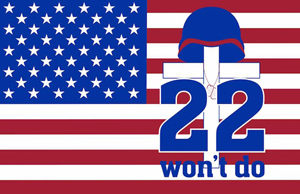 22 Won’t Do will take place on September 22, 2018 at the US Space and Rocket Center Aviation Challenge Area. Our goal is to have, at least, 2222 people doing 22 pushups to show our support to those warriors that need to understand that there is hope. Please don’t give up. Call the suicide prevention number, go to Facebook and find people going through the same feelings, find a friend. This donation will go toward The American Foundation for Suicide Prevention (Local Chapter) and other organizations as well. We are looking forward to an amazing event! This event will be held rain or shine. These warriors fought for us in all types of weather and we will show our support in the same dedicated way. We are ready to show our Veterans that Huntsville, Alabama supports them! Please come over and REGISTER for the event! When you register you are acknowledging you are in good health to participate and registration acts as a Release and Hold Harmless for the event Sponsors and those people that are putting on the event. You are responsible for yourself.